I think misoshiru is a good way to start this blog. It's very easy to make and very versatile. 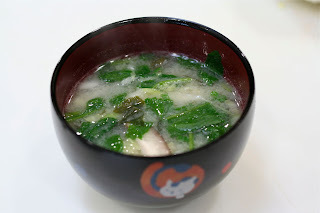 When my kids were living at home, we ate misoshiru often for breakfast, Japanese-style. 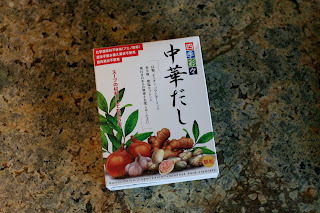 We often added okayu, or soft rice, my mother's cure all/comfort food. 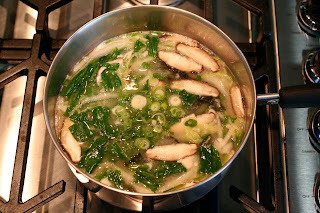 Sometimes we'd add bits of leftover chicken and whatever vegetables we had on hand. The possibilities are endless--and easily suited to your own taste. 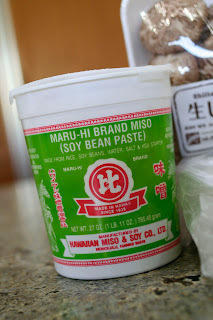 My favorite is adding a little brown rice to my misoshiru--at breakfast, lunch, or dinner! 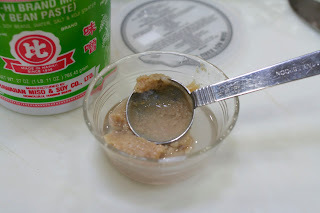 I have included my recipe at the end of this post. But first, the marketing! 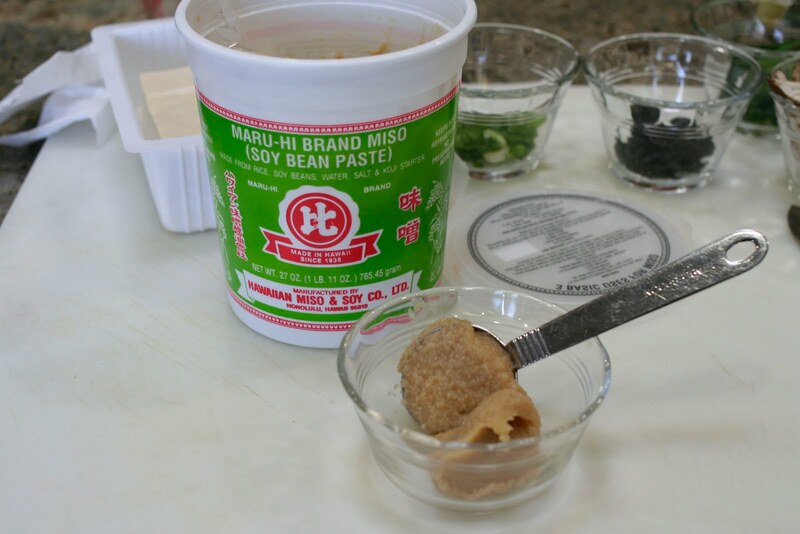 The first thing you'll need is dashi--the soup base. 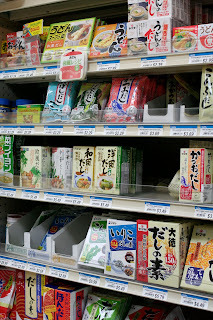 There a lot of different kinds of dashi pictured here at Nijiya Market. 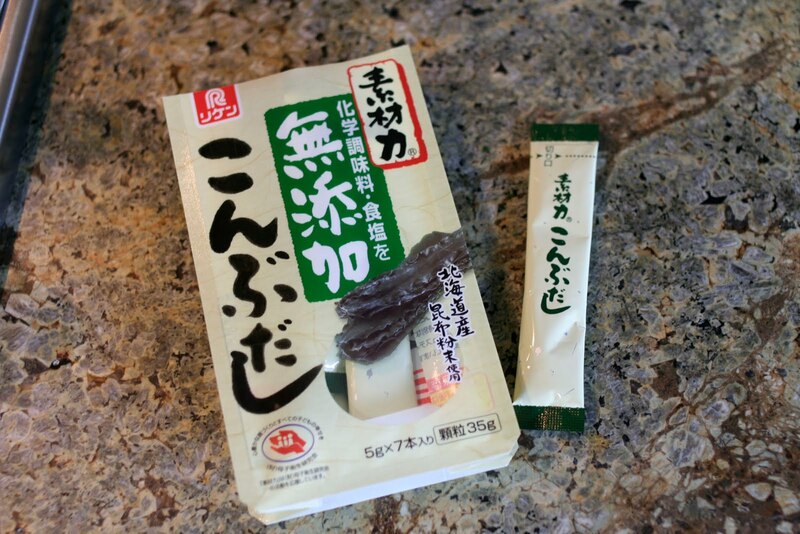 There's the bonito, sardine, shiitake, and kombu flavors, made by different companies. Each one is a little different, it may take some trying to find the one you like best. 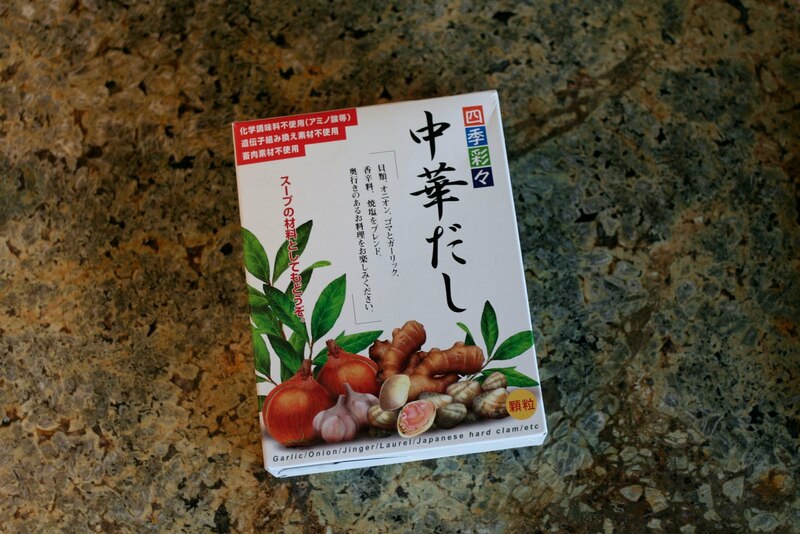 I like this kombu dashi. It doesn't have any bonito added, as some of the ones you think might be vegetarian do. Nor does it have msg or added salt. Most have msg or added salt. If you're not vegetarian, try this one. It was my favorite when I ate meat. It's got clams in it and has a nice flavor. 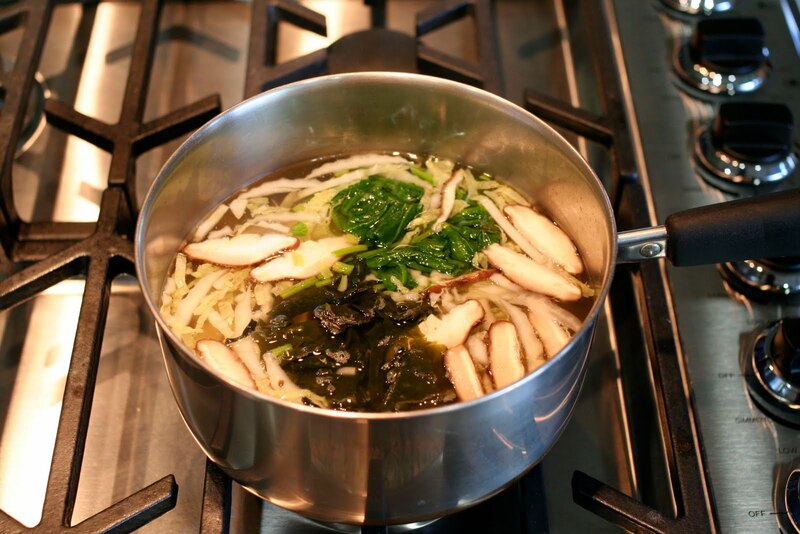 You can also use chicken broth along with the dashi, it makes for a nice, full-bodied broth. 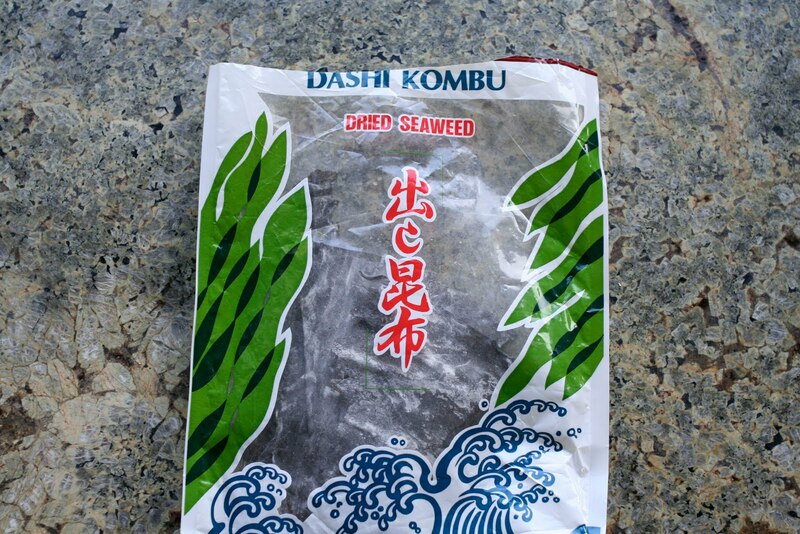 If you want to use a less processed, more natural ingredient, you can use this kombu. 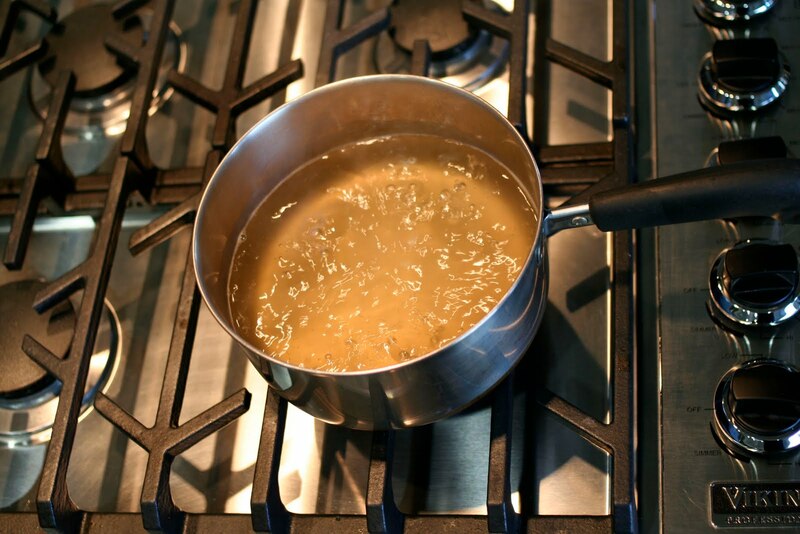 Break off a piece, wipe it, put it in your pot of water and take it out when it begins to boil. 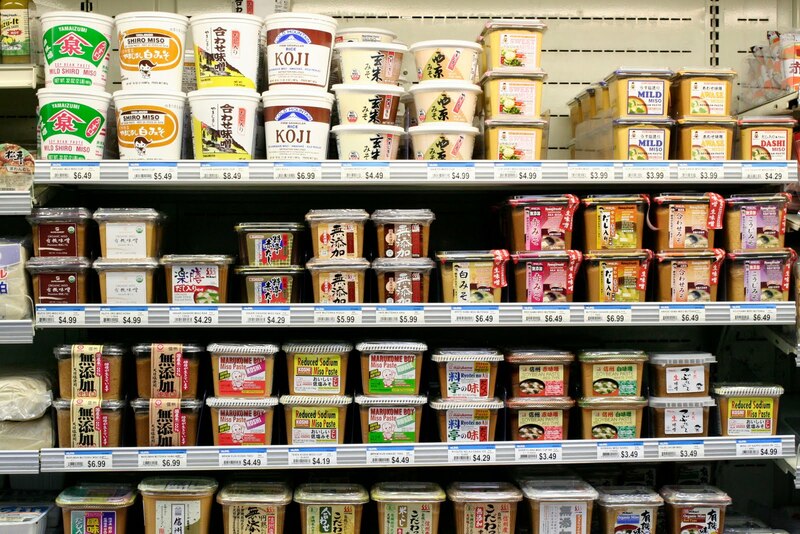 The brand of miso to use can also be a tough choice. It took me a long time to find the right one for me, I tried a lot of them! I finally found a Hawaiian brand I like. 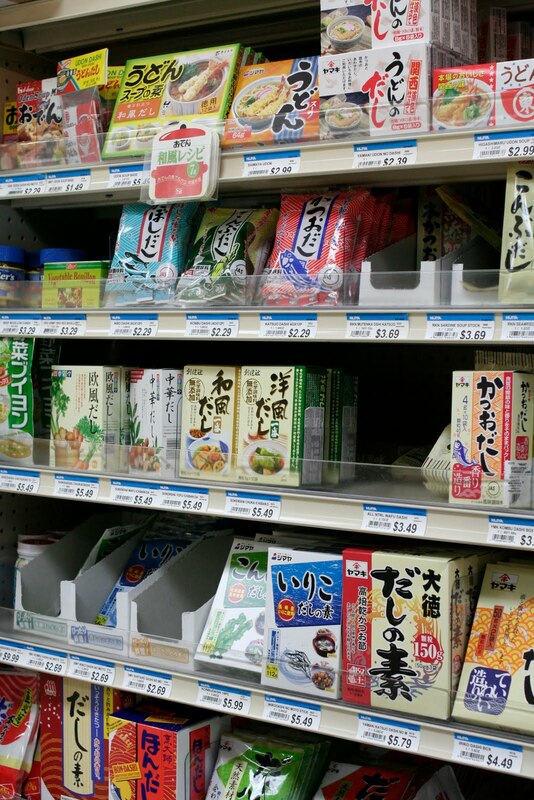 Unfortunately, they don't carry it at Nijiya Market, but they do carry it at Marukai. This is the one I like. To me, it's got a lighter, milder taste. 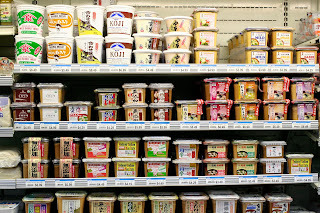 I prefer the shiro (white) miso over the aka (red) miso. 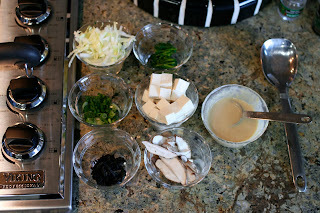 My friend Laura said the best misoshiru has a blend of both shiro & aka miso, giving the soup a fuller body. One fresh shiitake mushroom, sliced thinly. 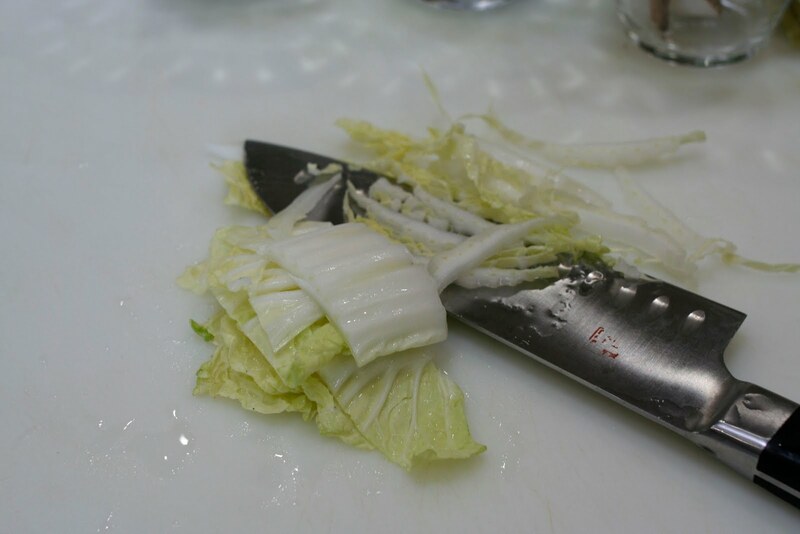 Slice the napa cabbage leaf. Nijiya Market generally has the best produce, the napa is usually green! 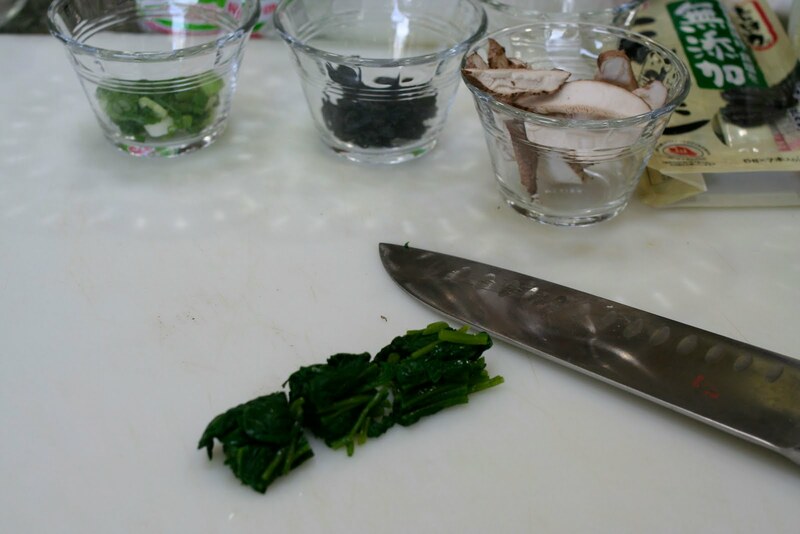 I had some boiled spinach on hand, and cut it into bite-sized pieces. I also like to add shingiku--chrysanthemum leaves. I think it adds a nice, earthy flavor. 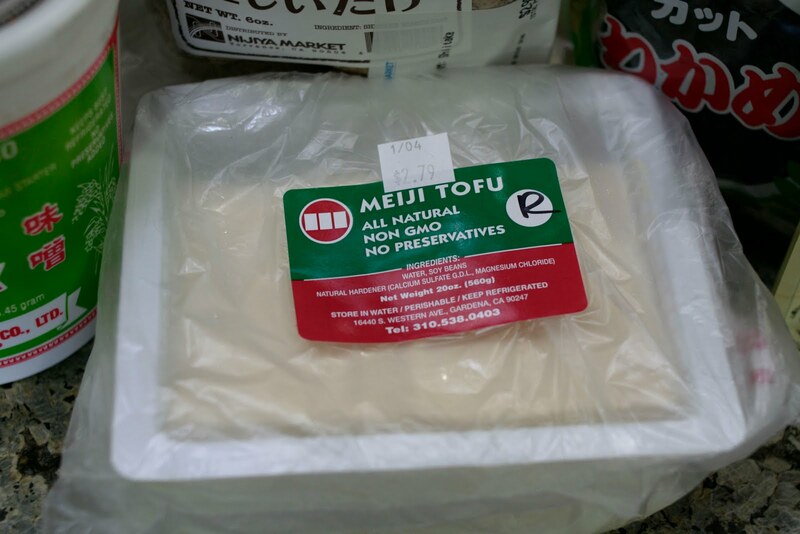 You'll need about 1/4 block of tofu. I found this fresh tofu, but if they didn't have this one, I would buy the blue label House brand tofu, medium or soft. Cut the tofu into little squares. 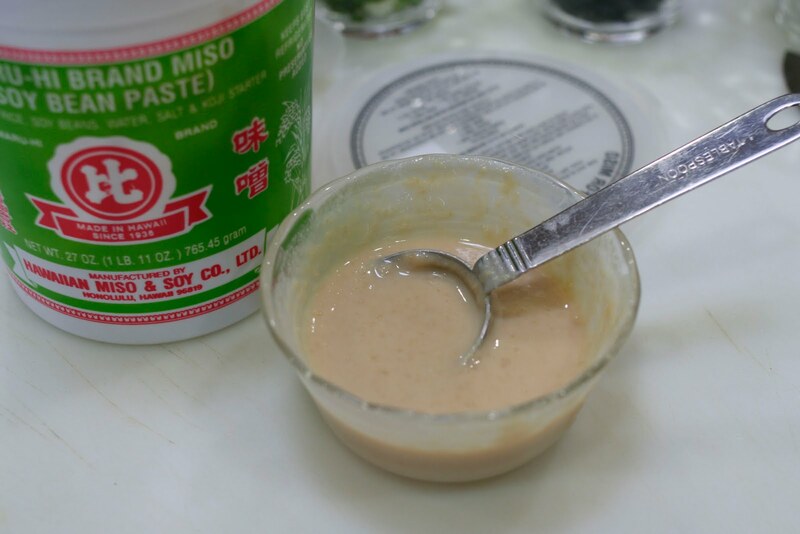 Measure 2 T miso paste into a small bowl. 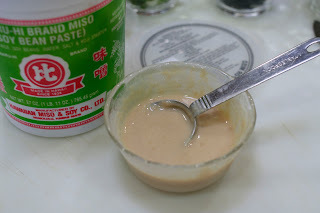 Thin the miso paste with 1 tablespoon water. Add more water if necessary to make paste runny, so it will be easy to stir into the soup. 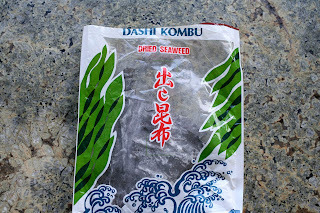 When the water is boiling, add the kombu dashi packet. Here are the ingredients ready to be added to the dashi broth. 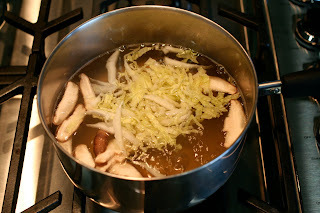 Add your shiitake and napa cabbage. 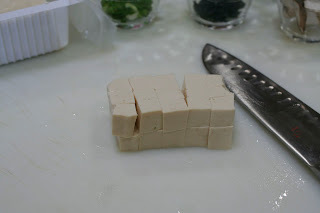 Then add the spinach, tofu, and dried, cut wakame. Add the green onions last. 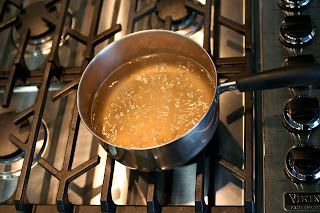 When you've added all your ingredients, and the water is boiling, turn off the stove and add the miso. You don't want to boil your soup after you've added the miso, you'll lose the nice aromatic bouquet of the miso. Ladle into bowls and serve immediately. Bring water to boil, adding dashi powder and slice of ginger. 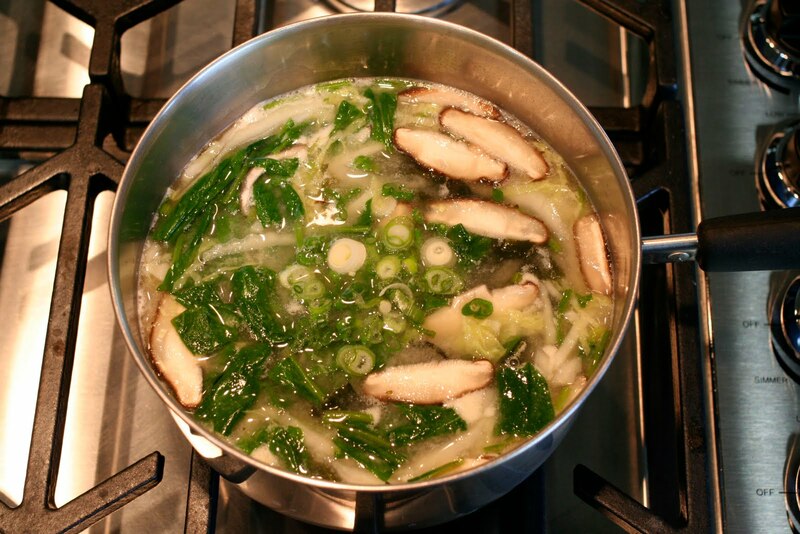 Add other ingredients in order of how fast they'll cook, starting with the shiitake and ending with the green onions. 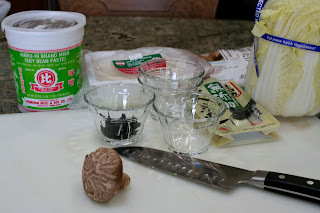 Turn off heat when all vegetables are added and stir in thinned miso paste. 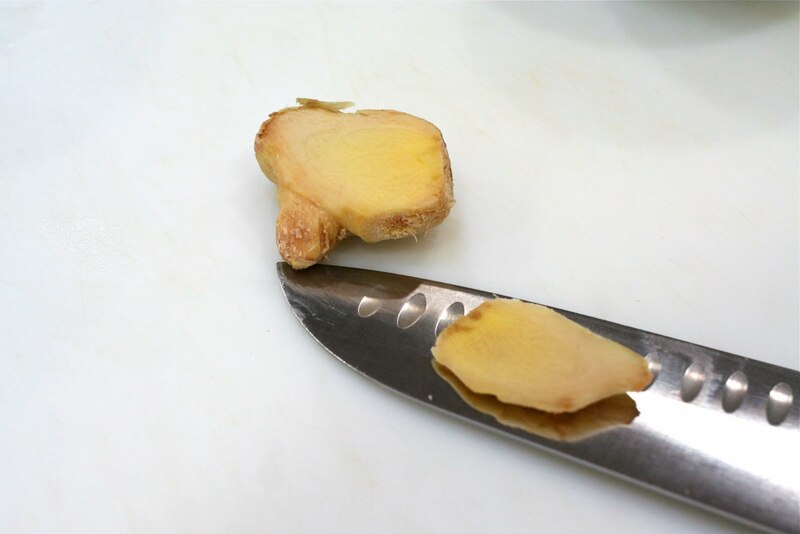 Remove the ginger slice & discard. Serve immediately. Serves 4. I'm so excited! Thank you for sharing your expertise with us! And what a perfectly clever name for your blog! Congratulations on your maiden entry!! Looking forward to many more! Great post! I miss having all the fun Asian markets around that CA offers :(. Thanks for sharing and great name! Yay! You have a blog!!! Its fun!! !